When an error or message pops up, you can send a screen shot of the error. Sending a screen shot is easy. Press "prt scr" on your keyboard, which captures the image, and then paste it into an email. Press the "prt scr" button on your keyboard to take a screen shot of your computer's full screen. Press alt + prt scr to take a screen shot of the active button. The "prt scr" button is usually on the top row of your keyboard. Nothing actually prints at this time. This process simply captures the image. Once you've captured the image, open an email to support@execu-tech.com. You can click the "Contact Support" link on your main Execu/Suite PMS home screen and then click "e-mail support". To paste the image into the email, type ctrl + v on your keyboard, or place your mouse in the body of the email, right-click and select Paste. 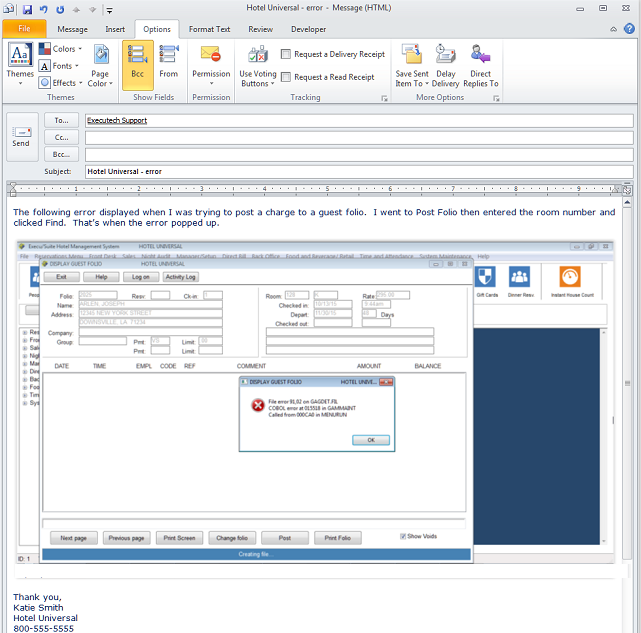 In the body of the email, you will need to explain what you were doing when the error or message displayed, what screen and field you were in, and what you typed on the keyboard. In the email subject, type your property name and the topic of the email. With the error or message on your screen, press prt scr or alt+prt scr on your keyboard. In the body of the email, write a description of what you were doing when the error displayed. Be as detailed as possible. The more information we have, the quicker we can fix the problem. In the email subject, type your property name and the topic of the email. Below the description, click ctrl+V or place your right-click and select Paste. This will place your image in the email. At night and on weekends, if you have a 24/7 support agreement with Execu/tech, you may call our support line at 850-747-0581 Option 2 then Option 1 to let us know you have send the error in an email, as we do not monitor the support email inbox after hours unless notified.